Home / COFFEE / Coffee for moka brewers / AROMA BLU ROASTED BEANS COFFEE – 250 gr. 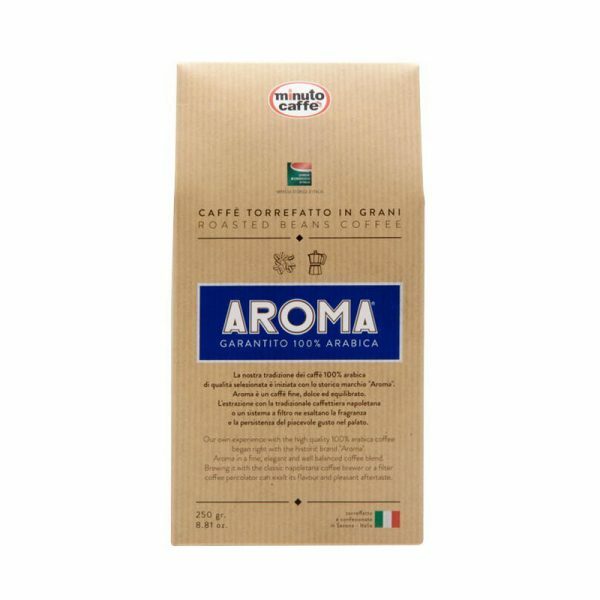 AROMA BLU ROASTED BEANS COFFEE – 250 gr. Our own experience with the high quality 100% arabica coffee began right with the historic brand “Aroma”. Aroma in a fine elegant and well balanced coffee blend. Brewing it with the classic napoletana coffee brewer or a filter coffee percolator can exalt its flavour and pleasant aftertaste. Roasted beans coffee packed in nitrogen atmosphere to be prepared with moka, napoletana brewers, drip brewers, french press. Bag in box with 250 grams of coffee. 24 boxes per masterbox. 8 masterboxes per floor pallet. 12 months of shelf life.